In report to Congress, Investor Advocate Fleming also said "reverse churning" of clients in wrap fee accounts needed to be aggressively policed. 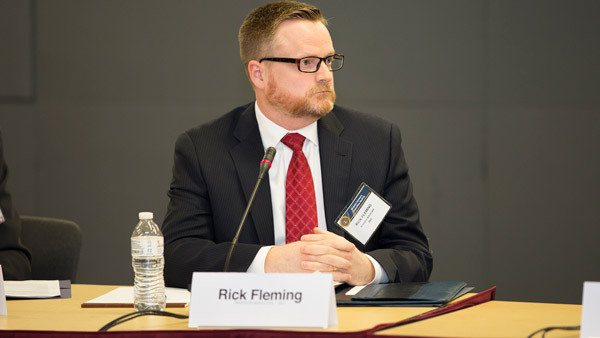 SEC investor advocate Rick Fleming. Insufficient advisor exams, tax-free exchanges of variable annuities, binary options and reverse churning of clients with wrap fee accounts are among the top concerns the Securities and Exchange Commission’s Investor Advocate has in the new year. Indeed, Fleming cited his 2014 Report on Objectives, filed June 30, in which he recommended that Congress provide sufficient resources to enable the SEC to conduct an adequate number of investment advisor exams. “This is an issue that does not require a great deal of study to understand,” Fleming said. “In FY 2014, the SEC examined approximately 10% of investment advisors, which equates to an examination cycle of once every 10 years. This level of coverage is simply inadequate to protect investors” from fraud. Fleming has championed allowing the SEC to collect user fees from advisors in order to boost the number of exams. Fleming said in his report that another area of concern involves the tax-free exchange of variable annuities, known as 1035 exchanges. Such exchanges allow an investor “to exchange an existing annuity contract for a new annuity contract without paying any tax on the income and investment gains in [his or her] current variable annuity contract,” he explained. While Section 1035 exchanges can benefit some investors, “some financial professionals try to generate sales by persuading investors to engage in these exchanges, even when the exchange is not advisable because of surrender charges or other features that offset the benefits,” Fleming said. The benefits of such exchanges can be seen in new developments in features that are now offered in variable annuities, which may provide investors an annuity that offers more preferable features than the one they already own, such as different annuity payout options, a larger death benefit or a broader selection of investment choices, Fleming said. Yet another area of concern is in binary options, which the report explains are “significantly different” from more conventional options in that binary options have different payouts, fees, risks, and an entirely different liquidity structure and investment process. A substantial portion of the binary options market takes place through internet-based trading platforms that are not necessarily complying with applicable U.S. regulatory requirements, Fleming said. “In fact, only a fraction of the binary options market is subject to oversight by United States regulators, such as the SEC and the Commodity Futures Trading Commission.” The number of internet-based binary options trading platforms has risen sharply in recent years, and this proliferation has led to an increase in the number of investor complaints about fraudulent promotion schemes involving binary options trading platforms. Fleming listed three categories of complaints: refusal to credit customer accounts or reimburse funds to customers; identity theft; and manipulation of software to generate losing trades. The Investor Advocate office will also continue to watch the trend among broker-dealers to migrate customers from commission-based accounts — in which broker-dealers generally earn commissions only when they execute trades — into accounts with fees that are based upon a percentage of assets in the account. A commission-based fee system “may create an incentive for ‘churning’ — a practice in which an unscrupulous registered representative makes excessive transactions in an account in order to generate more commissions,” the report says. Fleming doesn’t push for more rules to regulate reverse churning but calls for “aggressive enforcement action” to deter it.